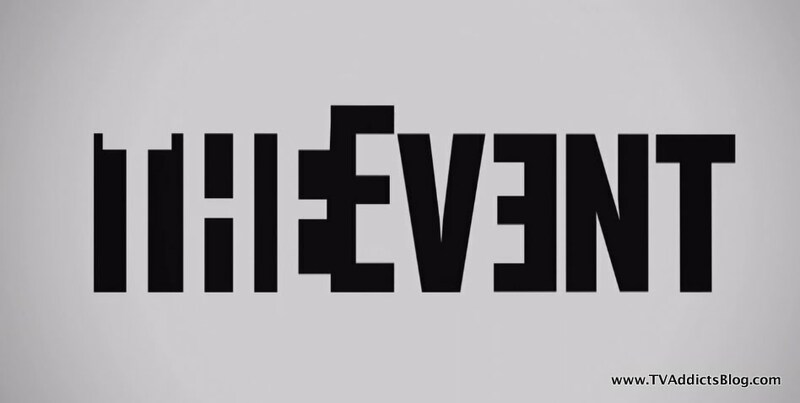 Hello Eventers! Welcome back after a 2 week hiatus for a new episode. Okay, now THIS is what I'm talking about! I really liked this episode. I may have unfairly reviewed the Simon centric episode from a couple weeks ago. While I enjoyed the episode, I just felt like something was missing. Maybe there was, maybe there wasn't but it certainly was a stepping stone to get to the excitement of this episode. I felt the drama, I thrived on the suspense, I went into my "thinking man" pose a few times when a new mystery or twist was upon us and of course there were a couple "we totally called that one!" moments to be proud of as well. So what else can I say but something that I say all the time? GOOD TIMES! (you LOSTIES were thinking I might bring out the big guns with the "W" word, weren't you? Sorry, just can't do it!) Anyway, any episode that can bring a more human side to Blake Sterling has done its job very well. Let's get into the recap! 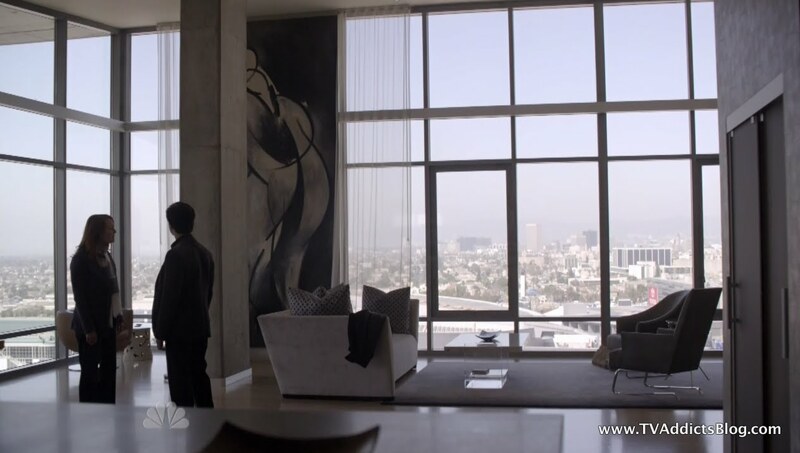 So lots of stuff was set up last episode and just begging to be delved into deeper. Sophia and Thomas escaped into a hatch and the blue light special imploded a building with human wannabe Simon still in it. Simon had left a trail of his "moleyness" (I like to make up words, in case you didn't know) behind him. Sean and Leila ran into an Alien Conspirator (Madeline Jackson) in Leila's parent's home and...well...just learned about aliens living amongst them! We continue all of these storylines and also take a deeper dive into the past of poor Blake Sterling as he tries to identify the mole in the present day. Okay, so Sean and Leila drill Madeline for more information about the aliens (which Madeline emphasizes that they are meant to be called EBEs) Leila plays the Scully to Sean's Mulder. Well, not really but he bought into it quicker than she did stating that it's the only lead they have to the weird stuff going on. 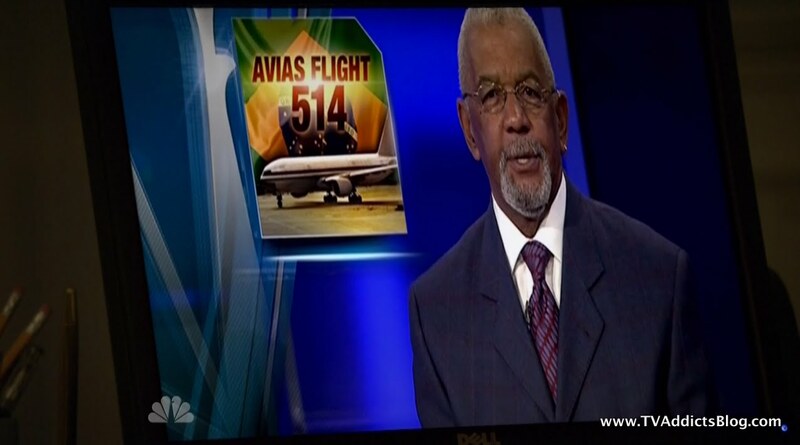 Sean lets leak that he was on Avias flight 514 and that it moved from one location to another in seconds. Madeline didn't know that Michael was piloting the flight. But that it all made sense. Martinez was rumored to be holding the press conference to "OUT THE ALIENS" to the public and there is a powerful force that would go to great lengths to stop that from happening. 2 birds, one stone. Kill the Prez, Kill Michael and his knowledge, problem solved. Michael apparently knew the existence of this individual who would go to these lengths to stop Martinez "for their own mysterious non-political reasons." 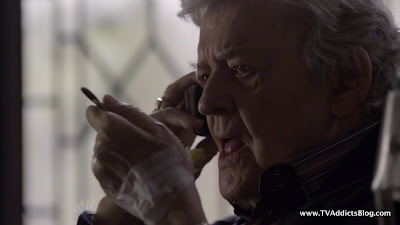 We learn in this episode that Hal Holbrook's character, Dempsey, is one of the men if not THE man behind this force. Who are they? Well, we're not quite certain yet. 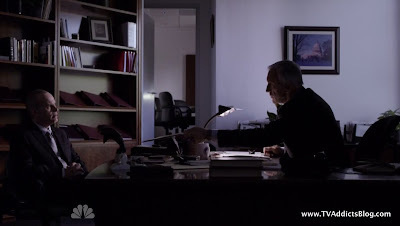 But we do know, and it is re-ephasized by Madeline, that they are behind the Buchanan killing and kidnappings, the plotting to destroy the President and pretty much everything that Sean and Leila have had to deal with since. Long story short, Madeline is able to look into the Michael's file. She stumbles, fairly quickly, into some new information in the file. There is a list of names and crazy codes. The codes, I'll share the picture. The names? Grace Chamberlain, Abby Stern, London O'Neil, Emily Griffiths, Laura Bellman, Hilary Chapman, Jia Szeto, Joanna Meyers, Jezabel Wyler, Adriana Guintoli, Clarice Foster, Blair Dalton, Maria Ortiz - We'll get to the names in a bit but Clarice Foster? Has to be a shout out to Silence of the Lambs, right? (Character/Actress) Madeline also points out that "most of them" are women. All Sean had to hear was that the numbers were CODES and then he knew he could throw them into a computer and work his magic. Okay, this is a bit of a stretch, but hey...he's a computer wiz well just pretend that he can do this! Madeline has a friend that can help and they move onward to that location. We first meet Dempsey as he is tending to an aloinopsis flower. They supposedly open every 2 years but this one has been genetically engineered to open every month. A seemingly pointless line, right? WRONG Genetically engineered flowers are one thing. How about genetically engineered humans? Well, we're getting ahead of ourselves as I don't want to discuss the episode ending cliffhanger this early. But we know that Dempsey has a vested interest in these EBEs and he doesn't want anyone else to know about them. As we can clearly see, Dempsey is a very wealthy man who spent millions of dollars working on this crazy flower. His research may possibly lead to being able to be utilized on human beings. 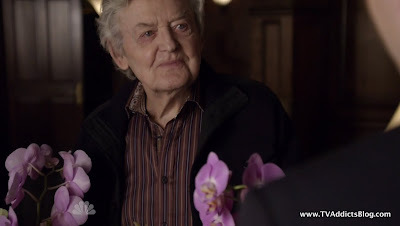 Dempsey is also a rather elderly man (Hal Holbrook is 85). The EBEs age very slowly, if at all. And Dempsey is in some kind of genetic engineering/cloning business? Can't be a coincidence at all, right? But we'll get to that later. 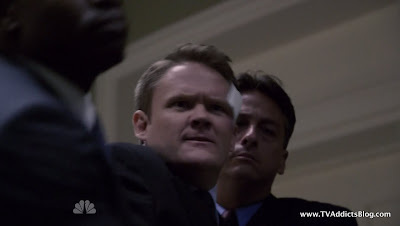 Some time later we see Dempsey talking to another one of his cronies who has investigated the Buchanan house and noted that they missed them. It's important to note that Dempsey is hooked up to an IV and shaking a bit as he eats his fruit or whatever. It's safe to say he is a sick man. The man on the other end of the phone identified Madeline Jackson on a cell phone with some voice identification software and figured out their destination. A team of armed Dempsians are on their way to take out Sean and Leila. OH NO!!! Stay tuned. Sean, Leila and Madeline arrive at her friend's apartment complex. 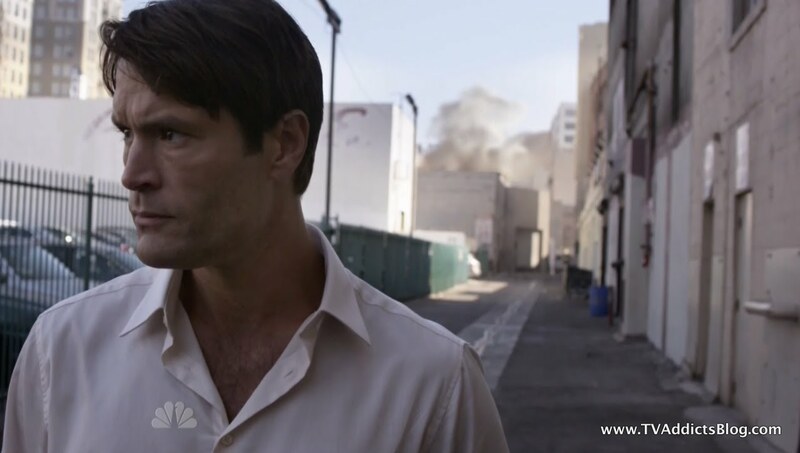 Peter, is a paranoid man who does not want any trouble that Madeline is bringing to his doorstep. After several attempts to send them away, Leila brings out the sob story. Her mother is dead and father/sister kidnapped. Apparently, he has a soft spot for that even if it's not the brightest of ideas to let them in. 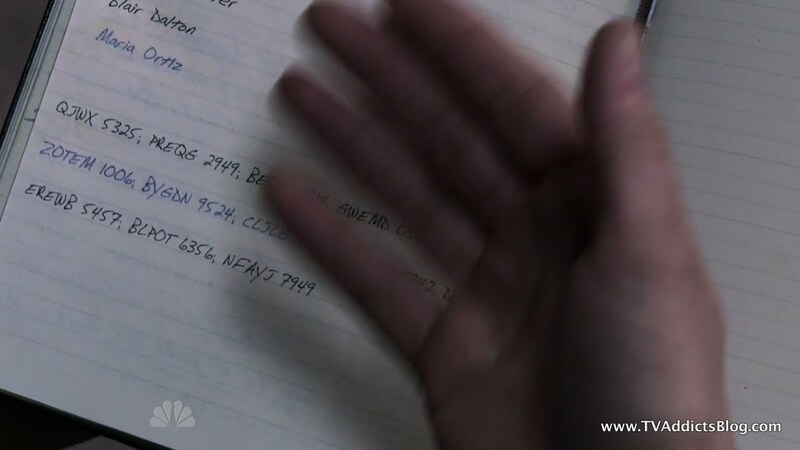 Peter takes one look at the codes and names and then reveals that he has sources in the intelligence community. He knows that Michael is alive and in government custody. This was great news to Leila. He did not have the same news about Samantha. He didn't have clear information so just assumes she is dead. Sean would not buy into this theory. Peter strongly urged them to "walk away" while they still had a chance. The codes are SEC ID numbers for shell corporations (I'm guessing not Shell Gas stations) based in Los Angeles. At least they have their next lead. And they better get there soon! I'm sure they can walk there in a few minutes of EVENT TV time! Of course, this conversation is interrupted by the arrival of Dempsey's men. They charge in, but Peter is ready for them with an "I told you so" line and a remote self-destruct device. They all bolt from the room, the men head into it. Peter blows the place and the people in it to kingdom come. Madeline and Peter disappear (HUH??? Where did they go? That sure was shady). Sean and Leila make a run for it until Leila starts crying and doesn't know where they're going. Sean calms her down and says they're getting closer. They're going to be okay. And that's where we leave them. I'm guessing, next stop Los Angeles. How will they get there? Yikes, maybe they should call up Agent Collier that they ditched! And here I thought Sophia and Thomas were going to be transported through the blue light to some place far away from Washington D.C. Nope! They actually used that underground hatch as a normal escape route. They came out a few blocks away from the implosion. Another EBE (Aaron?) was there waiting for them. 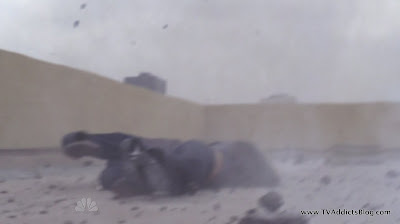 Sophia was not very thrilled with Thomas's antics of blowing up the building and taking innocent lives. They continue to have differences of opinion on how to go about their business. Sophia explains that these antics are only going to want to make Martinez and crew want to hunt them down even more. 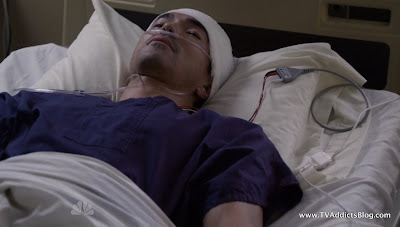 Aaron is put on assignment to figure out what happened to Simon. Back at Thomas's place they have a brief conversation about how he has made some decent money in 66 years. Thomas attributes their advanced math skills to be able to buy low and sell high. They have a guy out in the midwest making all of his investments and making loads of money keeping the attention off of Thomas. At first, I was getting a Back to the Future II vibe to the whole playing the stock market. They knew the history so they were able to buy and sell at the right times, cheat the system and make a fortune. (you know, if we still were theorizing that they're from the future) It's starting to sound less and less that time travel has anything to do with this. He clearly was talking about the advanced math skills helping them predict the stock market. He talked about humans not having the ability to predict it. Sophia is not impressed about any of this. Thomas states that he doesn't want to hear what happened to the building and receives a nice slap on the face from her. His assignment was to do what he needed to get them back home. But he destroyed everything Sophia was working on in the meantime. Killing people, infecting innocents....Thomas still argues it was right for them. Sophia declares that she is in charge and decides what is right for them. She knows where Simon and Aaron's loyalty is (and the rest of their free people). 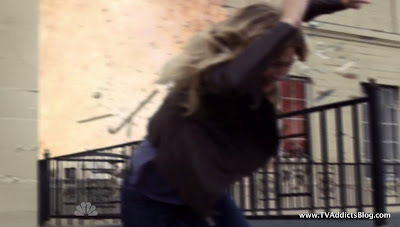 And she ORDERS Thomas to stand down. And then the big reveal.....Sophia is Thomas's mother! We totally called this in the past couple recaps! It was either going to be a LOVERS or Mother/Son thing. Definitely an intriguing little reveal. Thomas apologizes for the disrespect and Sophia lets it remain in the past. Will it be that easy to let it go? Doubtful. Thomas is too juicy of an antagonist to have him stand down so easily! Aaron, meanwhile, gathered information on Simon. He is in the hospital and is suspected to be the mole. No fear, they put in action a plan to save his cover and we'll get to that in the next section! 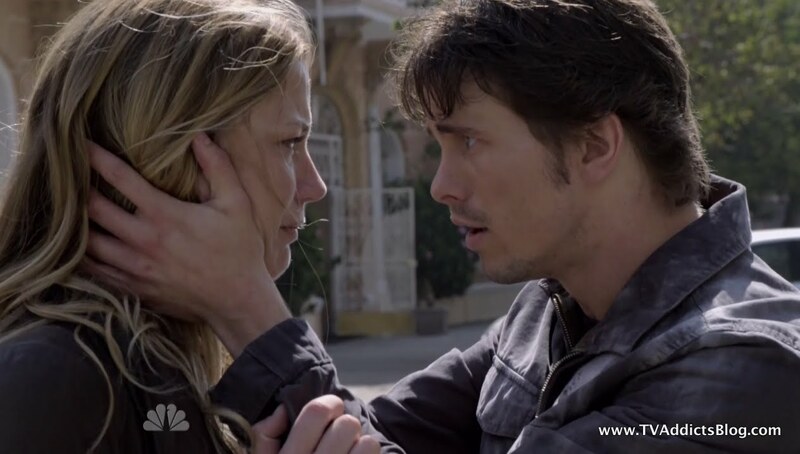 Thomas and Sophia have a moment later on when the Simon incident is taken care of. They discuss how far Thomas has progressed with a way home and how far there is to go. Bottom line, what we have seen is the limit to their powers right now. They can transport things across the country, they can use the power to implode buildings but they need MORE RAW materials to recreate what they need to get them home. What kind of materials you ask? Nuclear Warheads! We have seen the effects that this "portal" has done on a apparent "Minor" scale. What if they needed to create a much more powerful portal to get them home? Could it have devastating impacts on the planet they leave behind? Could that have something to do with Thomas's comment a few episodes ago "they're all going to die anyway"? Could their journey home BE "the event"? All good questions. 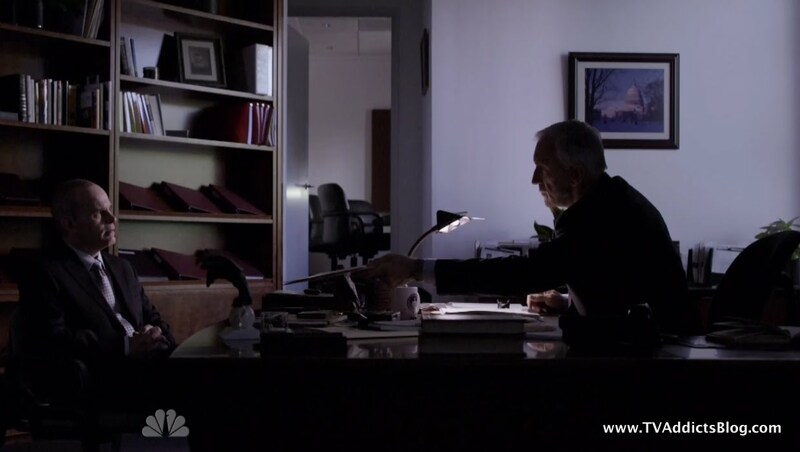 Thomas informs Sophia that he may have a way in but will need Sophia's help once they do. TO BE CONTINUED!!! We get a nice little back story to how Blake got his big break into his ultimate destination of CIA Director. A heartbreaking story that made us a little sympathetic to the character. We join him in his home uncorking a bottle of wine with his girlfriend and reminiscing about a trip to Barcelona where their car broke down. We are led down a path to see that Blake is hopelessly in love with her, and she appears to be respectively in love with him. He gets a call from his father, Edmond, who requests to see Blake. Edmond seems to have never been a big fan of Laura's. Apparently, he did some digging and found out that Laura is not "Laura" at all, but a Russian Spy, Svetlana something or other. She has been with Blake only to steal valuable intelligence. Edmond stresses Blake use this information to his advantage to MAKE a leap in his career rather than let it destroy his career. Blake, clearly broken up by the news, confronts Laura/Svetlana stating the episode's title "I know who you are!" But, Blake made it clear that he didn't care. Even if it started as an assignment. If she really did love him, they could flee to Buenos Aires and never return. Imagine the blow to his ego when she bolted at the first chance she got. And then, only to be shot by his father outside of his house. Blake screamed in agony. 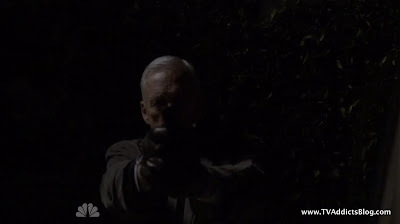 Edmond convinced him to take the gun and take credit for taking down a Russian spy. 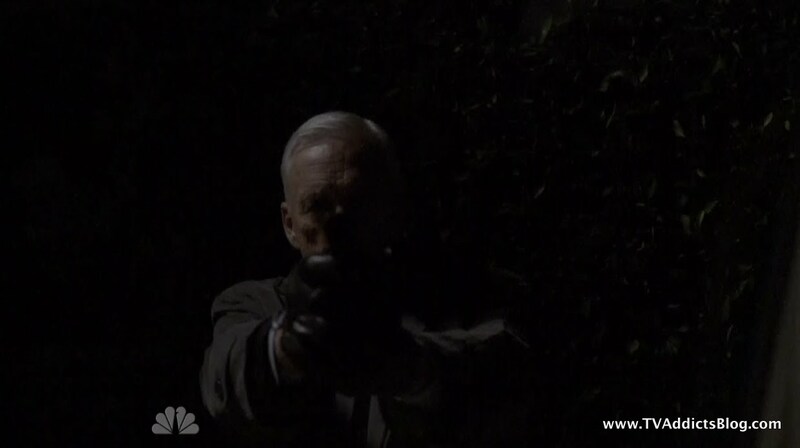 We never see him actually take the gun, but he is in a position of power now. It's safe to assume that he did. But, it might be more admirable to see if he got there on his own. In any case, it was a nice little backstory to humanize Blake. Everyone had him pinpointed as a bad guy involved with the assassination attempt on the President. I guess it still may be true, but I have been touting that this actor has played "evil" characters in the past and the writers used that to their advantage to show that this guy isn't so bad. Just a man doing his difficult job. A man with TRUST issues, and probably never having a good relationship with a woman ever since that incident. Amazing what a few scenes can do in an episode when done right! We join the President and Sterling in their War Room watching the building the implosion. We find out that there were roughly 30 people in that building when it collapsed. Blake reveals that he had just learned an hour before that there was a mole within his team. He wanted to find out who it was before letting Martinez know. Elias was not too thrilled with this information and demanded Blake identify the mole ASAP or he will find someone who can. 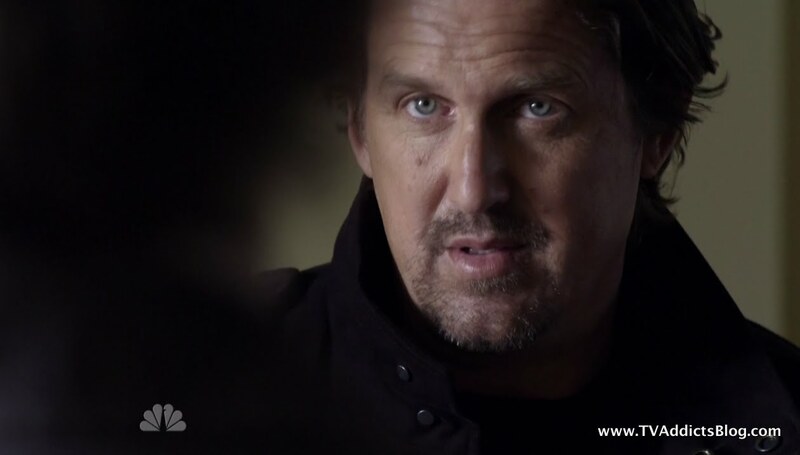 Long story short, Murphy is broken out of the trunk of his car and reveals that Simon Lee is the mole. While it is hard for everyone to believe, especially his friend from back in their training days, they go on with their job of PROVING that he certifiably is the mole. Blake's trust issues being identified in his backstory laid a nice backdrop for trusting Murphy and not batting an eye when he found out Simon was a potential mole. In any case, Simon's career is safe for the time being and he makes a full recovery. And Blake has won back the President's good graces and even shared a beer with him in the oval office. 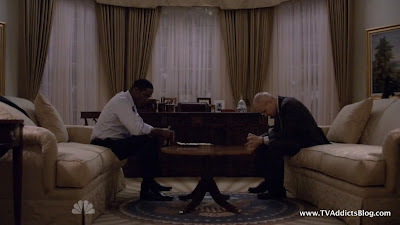 Nice... Also nice to see a moment of reflection for these 2 characters that have been on edge since episode 1. 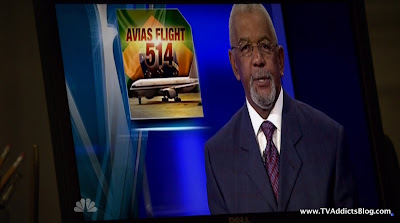 We should also note that it was announced on the news that the AVIAS 514 passengers were exposed to some kind of substance on board and are going to be released soon. I guess the story has changed since the flight supposedly disappeared over Brazil. I'm sure Michael Buchanan will not be one of these released people! 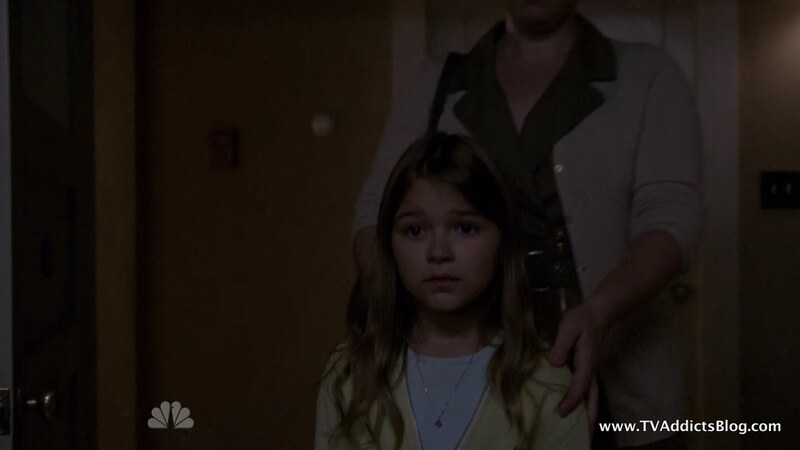 We have gone 6 episodes without too much information on Leila's sister, but we get 2 poignant scenes in this episode. The first has a woman picking up a handbag being dropped off by someone else and bringing it to her vehicle. 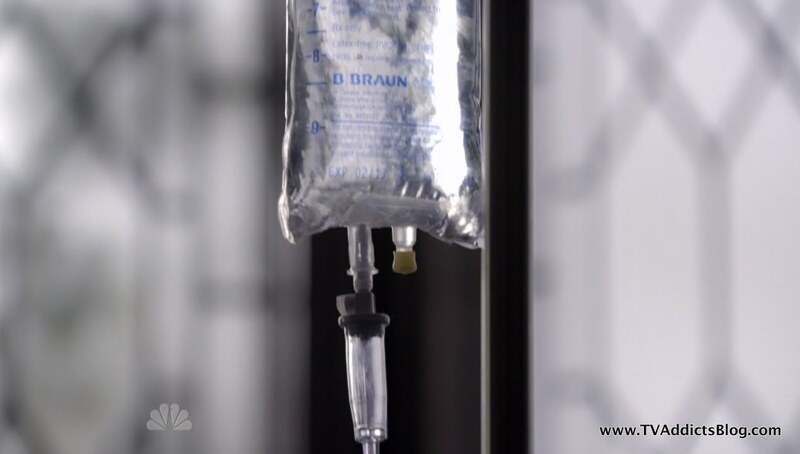 In the bag is some kind of drug and a syringe. She fills it up and then we see teared up Samantha (mouth duck-taped) in the car too. 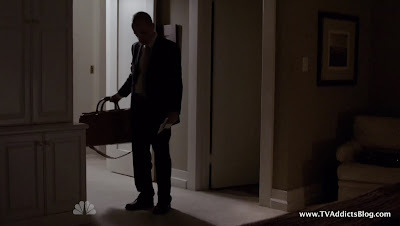 And at the end of the episode, we see Samantha being walked down a creepy hallway with the same woman begging her to be taken home to her family. 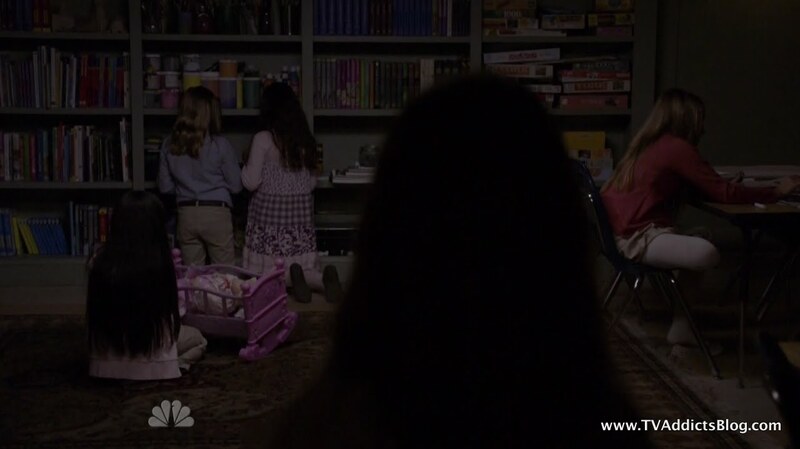 A door is opened to a play room with girls roughly the same age as Samantha with their heads turned away. The woman introduces Samantha to the girls and eventually they raise their heads to look towards her. And, yeah, the creepiest thing I've ever seen is the only way to explain those final seconds. The kids faces are all of ugly old ladies!!! WHAAAAT?!?!?!??! Ummmm, yeah I have seen 2 episodes of The Walking Dead now (which I have blogged by the way) and this topped my list of scary things I've seen lately. What is THAT all about? Well 2 things. 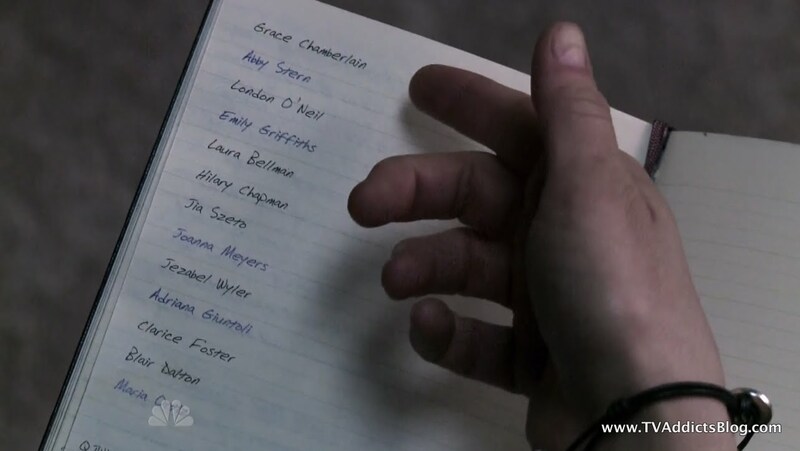 Clearly these are the girls from the list that Sean and Leila found, right? So they have been experimented on. Dempsey is into genetic engineering. To what end? Is he trying to age these girls into women at a rapid pace? Is he trying to discover the secret to the EBE's aging process? Is it to somehow benefit him as he nears his death bed? One thing is for sure, if Samantha is to remain a main character on this show and The Event has a multi-season run, I think they have already resolved their "WALT" issue! Anyway, this was by far my favorite episode so far. Each one of the 6 episodes that preceded it were essential building blocks to get to a story like this though. That's why I'm always a fan of the marathon and not the sprint. Payoffs are always more exciting when you properly build up the anticipation. And I certainly am anticipating NEXT week's episode. I'd say more about it but I know some like to remain spoiler free (even from PREVIEWS). So, I'll save my thoughts for 7 days. Hope you enjoyed my ramblings as always and I'll see you next week! Find my EVENT posts also at http://www.thetvevent.com/. If you're looking for more information on The Event, this site is a great source to check out. I also have worked out a deal to share my recaps over there as well. So read wherever you like! Keep checking back for posts on other shows. I have been recapping Fringe this season as well as keeping up with other shows I enjoy from time to time. I have recently taken a liking to commenting on The Walking Dead. I look forward to great discussions with everyone! Screen shots were provided courtesy of NBC, my TiVo and my Mac. Wow ! Great ep ! The way they did not show the girls' faces right away I knew it was gonna be big when they did - but did not see that coming at all ! Very interesting, and creepy. I totally agree that they are building up the stories quite nicely. Def getting better all the time and building in excitement. Waaay behind on Dexter & Boardwalk Empire, not yet caught up with Fringe either. HIMYM was a great one though. And loving Walking Dead too. @MJ - yeah i was thinking they'd all look like samantha or something. But I'm liking the direction they went...seems to tie in nicely with what we learned about Dempsey. We'll see! You're gonna love your Fringe fix. Enjoy it! I'm way behind on Boardwalk too...have 3 or 4 to watch. Dex is awesome...and HIMYM is en fuego. And saw your comment on Walking Dead and commented on that! What was your final verdict on the Lost encyclopedia ? Did they really tell anything that we did not know ? A couple of acronym points. I consider myself a Lostie, but I can't figure out what you mean by the "W" word. Does it stand for Walt? I didn't discover your blog until the last season of Lost, so i must have missed it? I think the acronym Madeline insists on using is "EBE's" - Extraterrestrial Biological Entities, not EB's. Otherwise great episode and great synopsis. Oh, and one other thought -- if the Event does turn out to some planet-destroying event caused by their journey home, I don't believe Sophia would allow it to happen. I continue to believe she is a morally good character and would not knowingly cause death to others in order to get home. (Unless not doing so would have an even worse outcome). @MJ - The LOST encyclopedia is a good time! I haven't had a chance to read it thoroughly from cover to cover yet...but once in awhile I'll pick it up and i'll check something which will inspire me to look something up and sometimes I'll stumble upon some good info. I really need to put a blog post together before I forget things. Things like Christian Shephard's appearance off-island was explained. People may not like the explanation but the book just indicates that Jack was seeing things. It wasn't the ghost of Christian or smokey....just him seeing visions of his father because of Smokey impersonating him on the Island. Damon and Carlton do provide a forward explaining that this Encyclopedia is the part of the glacier that is Submerged underwater (implying that the show that actually aired is the part of a glacier that is ABOVE water....there is much more under the surface that goes into putting the show on air). On occassion I am stumbling upon some nice tidbits of background. It's 25 bucks and totally worth the purchase if not just as a keepsake! I really will try to post something on the LOST blog eventually! @David - I should have been more specific to the LOST BLOG readers....If you ever noticed, for mostly ALL of the LOST recaps, I found new and exciting ways to give an episode a rating of "WOW" lol But I haven't been able to bring myself to use that word for any other TV show when recapping it. It's almost too sacred a word for me now to use for anything else! I know...I'm ridiculous! I'd like to think Sophia is a morally good character too. Interesting thought that not doing something may cause a worse outcome. We'll just have to wait and see! btw...i meant I should have been more specific in my post to "LOST ADDICTS BLOG READERS" not just "LOSTIES" in general. lol I'm having a problem explaining myself today! OOOH, I was just talking about The Event to a coworker, and he had a really intriguing thought - what if Dempsey, vampire-like, has been having the "youth hormone" or "youth telomeres" or something, extracted from those little girls and put in his IV in order to prolong his life? That's really disgusting and would explain why they all looked old. Apparently, poor Samantha is next! Hmmmmm very interesting David! Definitely would be an interesting twist. Doc Jensen speculated something like Dempsey is a young man also but subjected himself to "eternal youth" experimentations and ended up aging himself. All of it is very interesting stuff that the show could cover! To me its clear that Dempsey is trying to steal the secret of eternal life from the EBEs, he was probably some Operation Paperclip scientist (the famous episode of X-Files Paperclip had a scientist dealing with bioengineering flowers in a similar way, its a clear shout out) trying to continue to deal with it..Its also possible he is the "Agent" that Simon uses to get rich..because as someone who works for an investment company you usually need a Social Sec. #, which the EBEs may not have, so they may need Dempsey..
Did anyone else get a vibe that Dempsey really should have been smoking cigarettes the whole time? I mean..he really is CSM right? @AUSW - Yeah, I thought they'd be clones too. But I think no matter what way you look at it, I agree, Dempsey wants to live forever (and probably wants to return to his youth too). Hmmm...that's a real good point that it could be "THOMAS'S" broker/agent that he used. I didn't think about that. 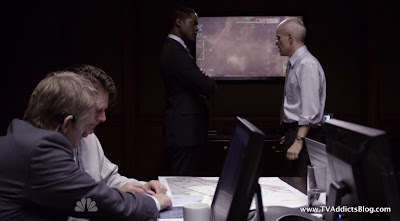 But, if Thomas was aware that Dempsey was behind the attack, would he not have told Sophia about it? I enjoyed this episode - lots going on! I still have to nit-pic though. 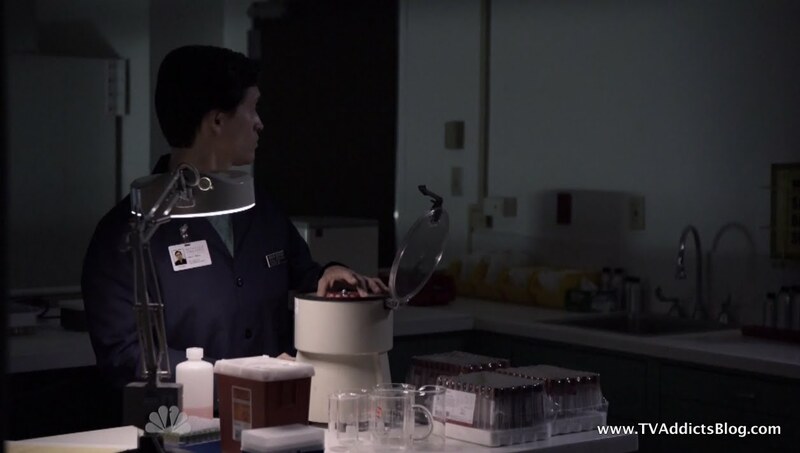 I can see someone being able to plant the fingerprint at the coffee shop, but Thomas being able to get into an FBI lab to alter bloodwork? That's a stretch since I thought as a faux-human, he was involved in nuclear research and not espionage! I agree that Sophia is a good person and is not out to destroy the planet. I still think Leila is a terrible actress and her scenes could have a lot more impact if she were better. I have a feeling the whole act of getting Leila and Sean to the computer geek/conspiracy theorist was a total set-up. Someone wanted to get that list of names to them and lead them to figure out what it means. I think that Hal Holbrook, sometime over the past 66 years, found out about the EBEs and has decided to use their power for his own agenda. Maybe Thomas and his people are trying to get Sean and the FBI to smoke this guy out and stop him? Mike - here's a little LOST trivia for you. The reporter helping Sean, isn't she the same actress who portrayed the lady that Sun shot on Desmond's boat? Still catching up on Dexter -- I'm halfway through Season 3 (the story arc with Jimmy Smits just ended) and also keeping up with the current season. You had told me Season 3 wasn't much, but I really enjoyed the interaction between Miguel & Dexter and the possibility that Dexter could actually have a friend. His look of betrayal when he found out about the blood on the shirt was OSCAR-WORTHY!!!! @Cajun - Nitpicks are always welcome! Good point on the bloodwork, but I'll let it slide. That was an FBI lab? I'm pretty sure they were at the hospital. I think he just found a way to sneak into whatever room the DNA samples or whatever were. They are a pretty intelligent race, he may have figured out over 66 years how to do something like that! I'm starting to agree with you about Sarah (Leila). Where I thought the Sean/Leila saga started off as the strongest part of the show...it seems to be weighing it down now. I'm tired of hearing her complain and him ask her "are you okay?" (hence the joking in the recap)... I guess the whole thing could be a setup. We'll see! 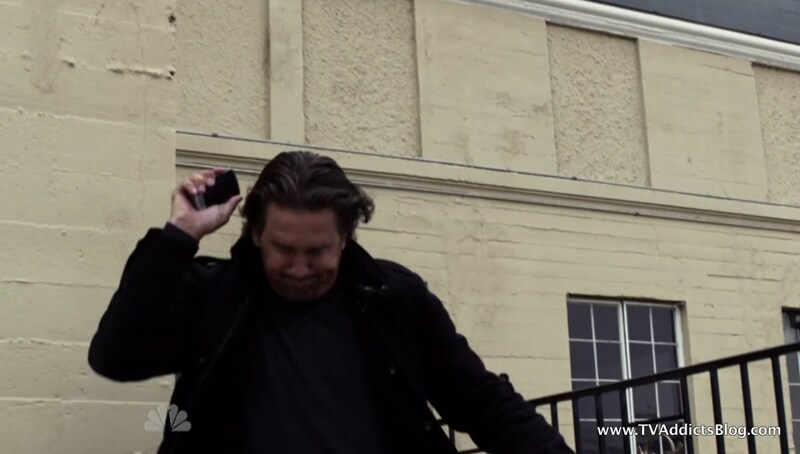 Yeah, Dempsey definitely knows about the EBEs...not sure if Thomas is even aware of Sean! (if AUStarWars is right...then Thomas may be very aware of Dempsey) I guess we'll see! Hmmm...you're halfway through season 3 and the Jimmy Smits arc ended??? Something doesn't sound right there. I hope I'm not spoiling, but I'm pretty sure he's in the entire season. lol (unless you think season 3 is more than 13 episodes!) I didn't mean to make you think I HATED season 3...but comparing to seasons 1, 2 and 4, it's definitely my least favorite of the 4. And I'm really enjoying season 5 too. That is not to say there were not some great episodes and moments in season 3 because there definitely were! And it was a great season...just not the best! I think I gotta hand it to season 4. It really was a great story arc from start to finish. I too had thoughts that Dempsey was somehow sucking the youth out of these girls - but if that is true then his experiment has been a failure as he looks quite old and frail. Maybe he is the reason that the EBE's are staying youthful? And they in turn are keeping him alive with some medical tech we don't yet have and they've promised to cure him once they are ready to leave ? Yeah, it would definitely seem like he was failing if that's the case, but that may be why they keep taking little girls! Isn't Samantha adopted? I guess it wouldn't be a big twist if she is a hybrid kid (EBE/human) or even a pure EBE...maybe she is the key to what he needs. I guess they could pull a crazy twist and have Dempsey being the key these people staying youthful. But how would he have infiltrated Inostranka...unless he interacted with them PRIOR to Inostranka...considering his age...that is certainly a possibility! The Event Wiki has Samantha Buchanan listed as the adopted daughter of Michael and Valerie Buchanan. I do not remember this being mentioned in the seven episodes which have aired. We did not see her in the episode in which Leila brings Sean home to be with her family at Thanksgiving. Valerie said that Sam was napping as the rest of the family ate the holiday meal. I thought this was suspicious at the time the episode was shown. On the other hand, when Sean and Leila were searching for clues in Michael’s stuff, they discovered a box of Sam’s clothes (I could not tell if they were baby clothes) that was placed on a shelf in the closet. This also seemed odd at the time. If Sam were an EBE, it is possible she would not have aged since she was adopted by the Buchanans. It is possible that the EBEs have a regular childhood and do not age/are slow to age until once they reach adulthood (like Vulcans on Star Trek). If she were a hybrid human/EBE, she may have had a normal childhood. All the abducted children are female. Do you think there is anything significant in that fact? Do you think that the family Vicky shot and then burned were connected with any of the other abducted girls? Was Adam to be shot along with the other members of his family because he was a male and of no use to Dempsey and his mad-scientist gang? Just some thought about this episode. I look forward to the next episode. Hi Mike, Enjoy all your recaps and look forward to reading them each week. The scene with Samantha at the end reminds me of one of my favorite "Twilight Zone" episodes. It showed this patient in bed with her entire head bandaged and the nurses and doctors surrounding her bed (whose faces weren't shown) were talking to her. They were telling her that she may not be cured as the operation/treatment may not have worked on her. "It isn't always successful," they said. As they s-l-o-w-l-y unwrapped her head, the nurse gasped in horror. The patient was a beautiful young woman. It then showed the faces of the nurse and doctor and they had pig-nose faces and were hidious to look at. They assured her that there were colonies where she could go and live and be accepted by those who look like her. A very well done episode in my opinion. I was expecting something like this with the Samantha girls scene. I think they did a brilliant job with this. It was very creepy, I agree!! I to LOVED, LOVED, LOVED Lost. What a magnificant show!! Nothing can top that I don't think!! Was wondering if they might do a Lost reunion, but then realized probably not since everyone was dead. LOL. I too will be watching The Event for a lot longer if it keeps getting better and better like last show. Thanks again for all your recaps. I forgot to mention, I think Blake and that girl were MARRIED - I saw a wedding ring on his finger! They were celebrating 10 months, so many weeks, etc. I think that was a wedding anniversary. Good story arc, it gave us some good info on how and why he got as high as he is (like father like son?) why he is so suspicious of everyone (although I'm sure everyone at the FBI is like that to some degree), that he's definately got a soft side (a TRULY hopeless romantic!) etc. And you were right, my slip. I think the DNA testing was probably being done in the hospital, and not an FBI lab. Oops! @Dee - Yeah, I don't think we ever heard on the show about Samantha, but people keep telling me about it. I'm guessing it was on the NBC profiles for each character. As for Samantha not being in the TG flashback - I just figured it was a budgetary thing and they didn't bring in the child actress for that small scene. But yeah there could be more to it! I guess I have been thinking like your 2nd thought on the EBE aging. They have a normal childhood but at some point age more slowly. Then again...they could just age VERY slowly...and could appear as children for many many years. These people have been here for 66 years but who knows how old they actually are?! I guess we still need info on all fo that. But yeah...if she ends up being a hybrid maybe she ages normally or at least DIFFERENT than the EBEs. For all we know she could age more rapidly for some reason. Which would make sense for this show (like i said in the recap "solving the WALT aging issue LOST had" ) Good question on Vicky...and looking back that makes a lot of sense. 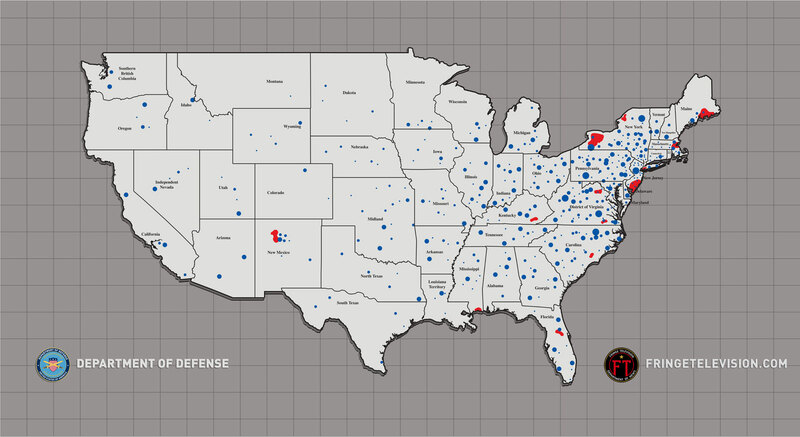 If Dempsey has one goal in mind...then there has to be a reason they were shooting up that place. I guess we'll find out more soon! @Char - Thanks for the props! You're not alone on your LOST obsession. I still am mourning the loss of that show and not sure when I'll recover! That Twilight Zone episode sounds very familiar, but I don't know if I've actually seen it. Sounds like a good time though! I agree that this episode was very well done. It was my favorite so far. I really felt like we were getting somewhere. Dempsey would not have had to infiltrate Inostranka to work with EBE's - Thomas and a whole bunch of them never went there ! Nice Cajun..enjoy season 4, it's a good one! Hmmm...it says they're going to air all 13 episodes THEN relaunch. Yikes..if that's the case, I may be missing a few recaps in december!! Ok, so I know I'm way late in commenting here, but I just found your blog and am really enjoying catching up with your and others' theories and ideas about The Event. One little thing that keeps making me laugh...The use of the acronym "EBEs" or "EBs" (as I heard it) reminds me of those annoying ads for Eggland's Best eggs, where the spokeswoman taps an egg with fake fingernail and says "Make mine EBs!"